Artistic splendor to brighten your holiday table, Winter Greetings is one of Lenox's most treasured heritage patterns. 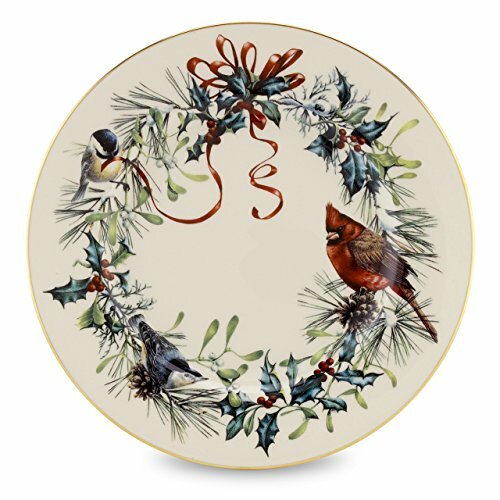 Bearing the acclaimed artistry of Catherine McClung, the festive design is an intricate composition of garden birds, red and gold bows and holly. Rich in color, decorate your table to warm cranberry and pine hughes. With our corporate office located in Pennsylvania and our fine dinnerware factory in Kinston, North Carolina we are proud to be a part of American tradition. With all of the craftsmanship and quality for which a pattern is known, it is no surprise that Winter Greetings is a treasured collection in homes worldwide. Crafted of Lenox ivory bone china accented with 24 karat gold, Lenox Winter Greetings fine dinnerware is made in the USA by American artisans and is dishwasher safe for your convenience. Best of all, this classic collection is created by Lenox, America's first name in home entertaining, known around the world for offering a unique combination of design artistry and superior quality for over 125 years. The confidence that Lenox has in the unmatched durability of every product they offer is backed by a lifetime breakage replacement policy to guarantee many years of enjoyment to each customer. Get your table set for festive dining with these beautiful 6 Salad Plates. The generously-sized Winter Greetings Salad Plate will help start every seasonal celebration in classic holiday style.